a presidential address – Goat anyone? 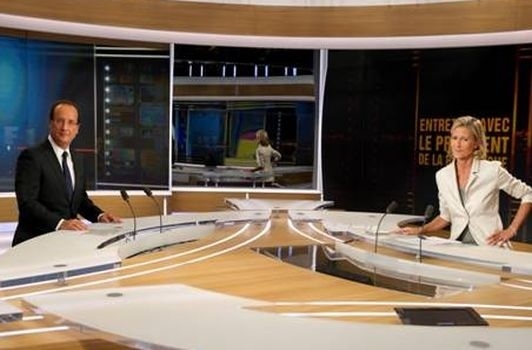 Every three or four months, I’m told, the French president appears on national television to address the people. With unemployment at a 13 year high, economic growth under one percent, and a falling approval rating, (sound familiar?) President Francois Hollande’s Sunday night address was highly anticipated. In America, we’re fairly familiar with this sort of thing. Must-see-tv will be interrupted and our preferred television personality will take us to the Oval Office or perhaps a fireside chat where the president will read some prepared remarks, usually more warm and fuzzy than substantive. Apparently, Hollande’s predecessor “Sarko l’Américain” made many of his addresses from the Elysee Palace in this vein – lots of platitudes, not lots of numbers. Hollande, however, is a Socialist, and that’s not a pejorative label political entertainers have given him to inspire fear, but self-identifying and descriptive. To wit, this by all accounts significant address was part of the 8pm newscast. Luckily numbers comprise a large portion of my French vocabulary, so I understood a good portion of his detailed remarks. My roommates thought the “speech” was a success. There were details, and plans, and schedules. It all reflected the platform he ran on, though perhaps not as socialist as they would prefer.